Ondaatje’s novel is a poetic intersection of four stranger’s lives during their stay in an abandoned Italian villa at the end of World War II. 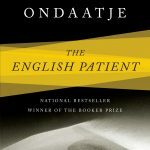 There is Hana–the nurse, Caravaggio–the handless thief, Kip–the bomb defuser, and the English patient–the mysterious, bedridden man with severe burns covering the entirety of his body. With a slow and eloquent pace, the book gives each character the time to recount and process their lives and identities during the war. All the while, the mystery of the English patient unravels in the form of fragmented and feverish memories that conclude in a tragic tale of love and loss. What is revealed through their stories speaks to the complexity of identity, “otherness,” and the global consequences of war on cultural and geographical borders. What I love about this book is how four perfect strangers come to realize that they, as people of the world, share “communal histories” and those cultural borders that suggest otherwise are meaningless in the face of loss. Their self identities, which were previously described in terms of nationalities, become blurred and then reactualized in the presence of the English patient–who is both literally and figuratively someone whose identity has been burned away from his very being. Ondaatje’s book is a deep reflection of the shared human experience and the tragedies of war. Find it in our catalog.